Upper Deck is a 3 bedroom home sleeps 6 and includes 2 full baths, 2 living areas and 2 decks. An easy, 2/10ths of a mile walk to beautiful Ridgevale Beach on Nantucket Sound! Sandy beach with the warm water of Nantucket Sound, and gentle rolling waves. It's a great location. 'Upper Deck' is extremely clean and well maintained, and bed and bath linens are included. This single family, free standing home offers a grassy yard for playing. ten minute drive away. It's a charming New England fishing village. The quaint village of Harwich Port is not far. Jen Huckman - please mention 'Upper Deck Chatham' when calling - thank you! outdoor shower, A Cape Cod Tradition! soooo many opportunities to kayak in Chatham! Upper Deck is a free standing, single family home. This is an "upside down house", where the main living area and kitchen are on the top floor. The Wicked Cool Upper Deck is fantastic! The house is very confortable and was perfectly clean when we arrived ! Thank you so much for vacationing at the Upper Deck! So glad you enjoyed wonderful Ridgevale Beach. It is a great spot! Thank you for your feedback on our housekeeping -- we work very hard to make sure guests arrive to a very clean home. Hope to see you again soon! We enjoyed every minute and loved the fact that Ridgevale Beach was so close. We would always walk down a second time to watch the colors at sunset. Downtown Chatham was just a short drive, so we shopped and ate there often. Very charming town, indeed. We all loved visiting the Chatham Bars Inn and watched the many grey seals in the harbor. No shark sightings! The house was more clean than any rental we'd had before. Great hosts, for sure. Thanks Jen! We couldn't have asked for a nicer place to relax, the house was fantastic. Very clean, new, airy and light...it was that good our friends kids came for sleep overs the week we rented. Beautiful spacious kitchen with all the amenities one would need however if you prefer to eat out then Chatham town center is only 5 minutes away in the car with plenty of restaurants. Beach was a stones throw away with easy to rent paddle boards, kayaks as well as serving food. Jen did a great job of explaining what to expect and was extremely polite and provided timely correspondences. We had a great time and would definitely be looking to go back time after time.. The UpperDeck Chatham was fantastic. It was very clean, spacious, airy and light. The beach was a stones throw away with easy to rent paddleboards and more. All the rooms were very well maintained and cozy. The kitchen is great for a large family and had all the amenities. However if you don't enjoy cooking Chatham Center was a five minute drive which offered lots of different restaurant. Jen was very polite and gave us many tips on what to do while there. She made us feel very welcome and made us feel like we were at home. The house was so great that our kid's friends kept coming over for sleepovers. :) Looking forward to coming again. this is a wonderful place to stay on cape cod for multiple reasons: the property itself is modern, immaculately maintained, and centrally air conditioned. secondly it is literally a 3 minute walk to beautiful Ridgevale beach in chatham, a great family beach for swimming and with a snack bar, kayak, paddleboard and sailiboat rental shop......what else could anyone want....a great place to stay....p.s. linens, beach towels, chairs, etc. are all provided, with a tasty cranberry bread awaiting your arrival!!! Very short walk to the beach, short drive to town, clean and roomy. Great customer service and great area for kids....would recommend it to all! 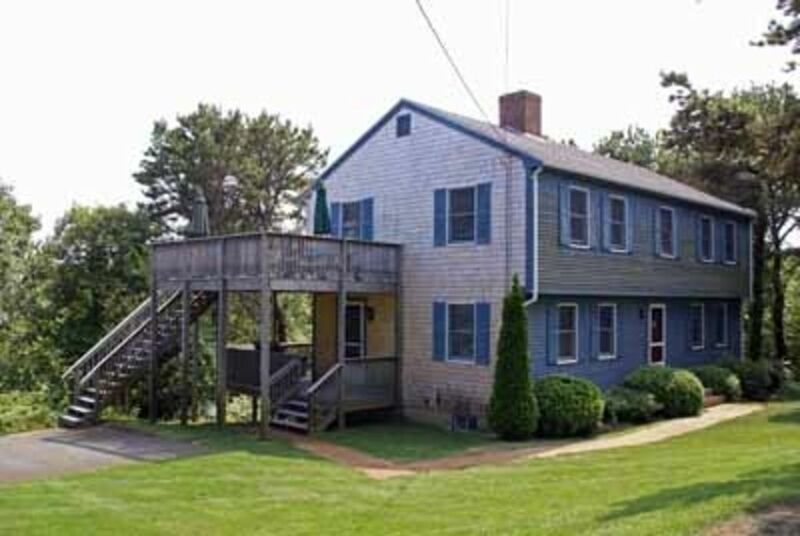 Your vacation retreat is a 2/10ths of a mile walk to Ridgevale Beach on Nantucket Sound. Enjoy beach combing, relaxing, swimming and jumping the gentle, rolling waves. 'Upper Deck' is a single family home on two floors. This is an 'upside down' house with kitchen, living room, dining and master bedroom on the top floor, and a 2nd living room/den, laundry, and two bedrooms (both two twins) on the first floor. We do our best to offer this home at the best possible price and give you no run-around or surprises with added fees. At our published prices, we generally sell out in Summer, and there is rarely a need to lower the price. If, though, you see some dates coming right up that are empty, or in June/Sept we'll do our best to rent the dates -- and may be able to take a little something off the price.